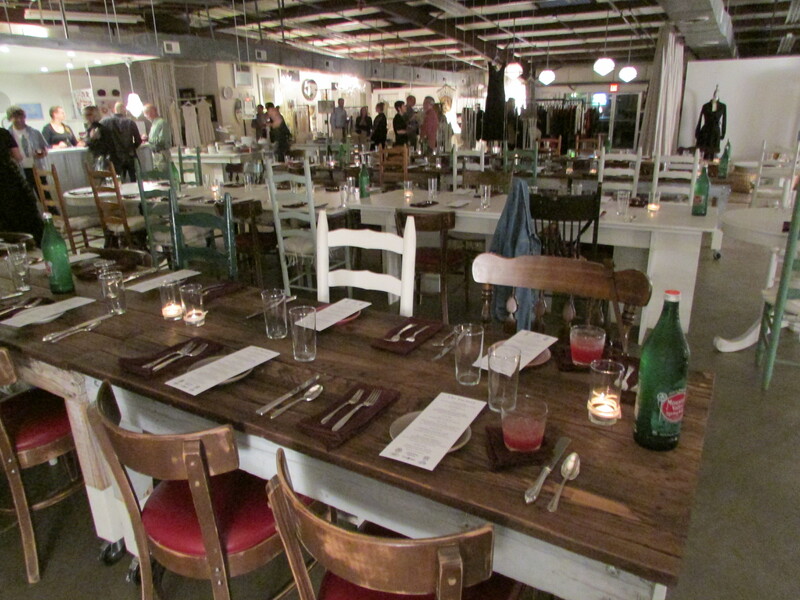 Last night was another memorable evening at the Alabama Chanin Factory (www.alabama.chanin.com) in Florence, Alabama. Natalie Chanin and her tireless staff hosted another “Friends of the Café” dinner event featuring executive chef Drew Robinson and Nicholas Pihakis of Birmingham-based Jim ’N Nick’s Bar-B-Q (www.jimnnicks.com). The October 10 event was the fourth and final “Friends of the Café” dinner for 2014. I am already looking forward to the 2015 schedule. My friend Cindy Edwards and I were lucky enough to attend three of the four 2014 dinners. The previous two were fundraisers for Southern Foodways Alliance (www.southernfoodways.org), of which I am a “dues paying” member. Last night’s event benefits “The Fatback Collective Fund.” The Fatback Collective is an impressive array of “chefs, writers, and pig cookers” who are supporting a philosophy of sustainable and humanely raised pork, local ingredients, support of community, and sharing of knowledge. They fundraise for many compatible causes and provide assistance in their communities when tragedy strikes. For example, Fatback Collective recently sponsored a series of successful fundraisers for a South Carolina pitmaster who lost his pit to fire in 2013. Last night’s meal was a juxtaposition of all of the elements that contribute to the Fatback philosophy. During the cocktail hour, featuring a “Donkey’s Daddy” cocktail, mushroom tamales were served to each table. That was followed by a four course meal featuring local ingredients including produce from the Jones Valley Teaching Farm (www.jonesvalleyteachingfarm.org) in downtown Birmingham, Gulf shrimp, Fatback Pig Project porchetta, and guinea hens from White Oak Pastures in Georgia (www.whiteoakpastures.com). Each course featured beer pairings from Birmingham’s Good People Brewing Company (www.goodpeoplebrewing.com). Chanin is accomplishing her goal of supporting and sustaining her community in many ways and these dinners are just a part of that big and impressive picture. As a result of these events, a community of like-minded individuals is finding each other – sharing thoughts and energy. Last night it was a pleasure to once again visit with Donna and Doug Woodford of Bluewater Creek Farm (www.bluewatercreekfarm.com). Bluewater Creek Farm is a family-owned sustainable farm in the Shoals area of northwest Alabama. Doug was proudly showing off pictures of a very handsome rooster and of a recent acquisition, a South Poll Grass Cattle bull. I learned that South Poll is an Alabama-based cattle breed that is bred to thrive on a grass-based diet and to tolerate the heat of the Southern summer (www.southpoll.com). I was also pleased to learn that Bluewater Creek’s most recent batch of chickens recently started laying. Nancy Campbell and Charles Day, friends from Tuscaloosa, were also back at the dinner last night. We met at the July dinner and have remained in contact ever since. They shared news of a recent visit to a saltwater shrimp farm in Greene County, Alabama – 150 miles inland from the Gulf of Mexico. This was exciting news to me. Charles has also begun to cultivate domestic culinary mushrooms. The spores are shipped to him and it was fascinating and tempting to learn about the process. It also gave me a nifty idea for my food-minded nephew’s 11th birthday present. A number of websites are referenced in this post. I hope that readers will be inspired to check out one or more of them and participate as their interests and means dictate. They are all causes that mean something to me and deserve our support and commitment. An amazing and innovative meal. Camaraderie with a community of people with shared interests and values. New knowledge and understanding. The “Friends of the Café” dinners in Florence have quickly become an essential ingredient in the process of strengthening a commitment to culture, community, and the values that will help change our world and move us steadily forward. This entry was posted in Alabama, culture, food and tagged Alabama Chanin, Bluewater Creek Farm, Fatback Collective, food, Good People Brewing Co., Jim 'N Nick's Bar-B-Q, Jones Valley Teaching Farm, White Oak Pastures on October 11, 2014 by gedwardjourney.